Many consumer goods companies suffer from in-store execution challenges, which inhibit their sales growth and position them as less-than-optimal trading partners by retailers. Many have come to see retail execution as a cost of doing business instead of a competitive weapon that can deliver the desired sales growth. However, new capabilities have emerged across the spectrum of go-to-market models (DSD, van sales, warehouse delivered, and distributor management) that represent a new level in retail execution. 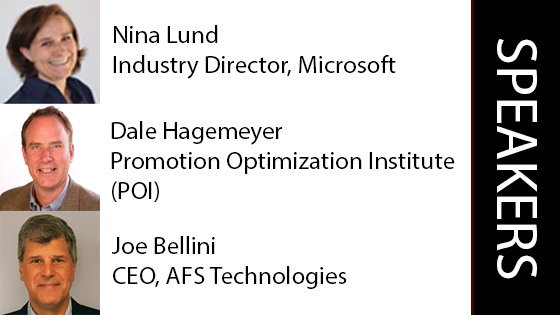 Join Microsoft, Promotion Optimization Institute & AFS for a webinar where you’ll be taken through new POI Consumer Goods industry research and will learn how the right combination of technology and business process enablement can deliver significant wins. Retail execution is often seen as a cost of doing business rather than what is truly is: a mission-critical tool to realize sales growth. But to survive and compete, retailers and consumer goods organizations must do more than embrace digital transformation – they have to recognize retail execution opportunities and take advantage of them. Field operations have to be more efficient and productive. They have to move from being transactional to analytical, and provide best practices in order to be better partners. But technology alone can’t achieve those goals. 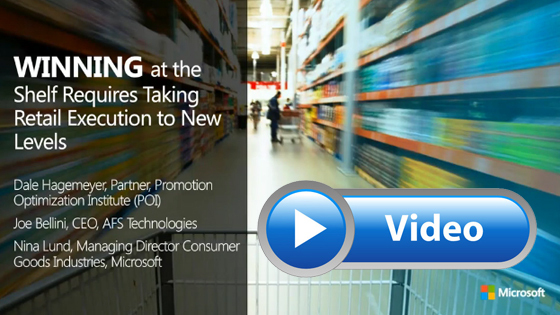 Microsoft and AFS Technologies have partnered to create tools that empower decision-making while in the store, handle data and push it to field sales at the right time, provide new social capabilities and much more. In this webinar, market experts take a look at today’s retail execution challenges and how digital tools provide new opportunities to improve shelf performance, promotion compliance and drive increased profitability.